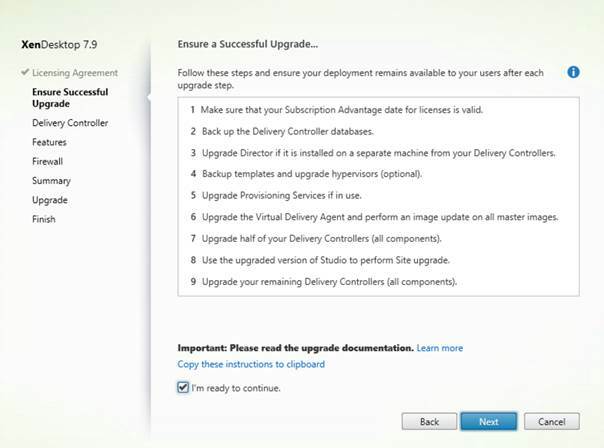 In this step by step guide, I will show you the steps for upgrading a XenDesktop 7.x infrastructure to the latest release. 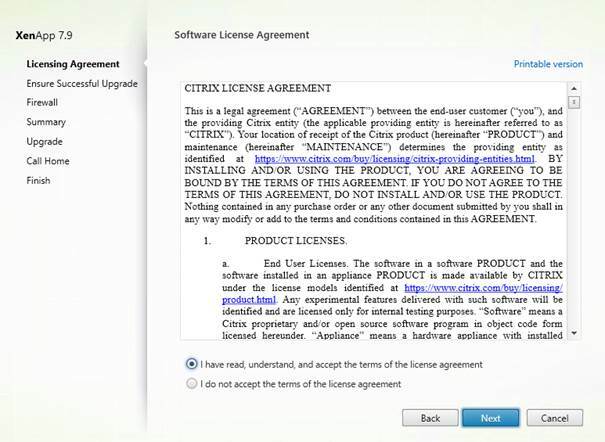 With the previous release of Citrix XenApp version, upgrading was a word which was not available in the Citrix dictionary. 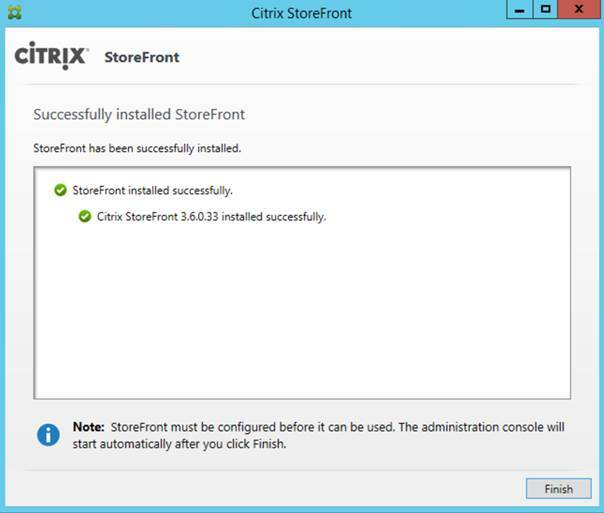 It was adviced to go through a new install and also in practice this was the way to go to a newer version of the Citrix software. In that timeframe it was not a bad thing as almost every upgrade also involved a new version of the Operating System. 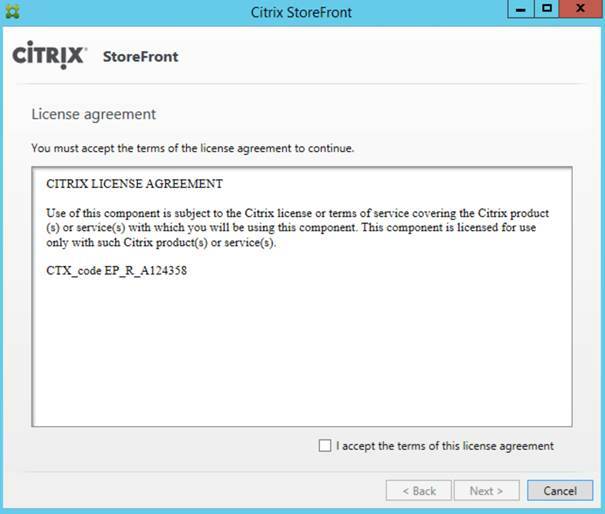 When this was no longer the case for all scenarios, Citrix introduced tools to export the configuration out of the current environment and import it again. 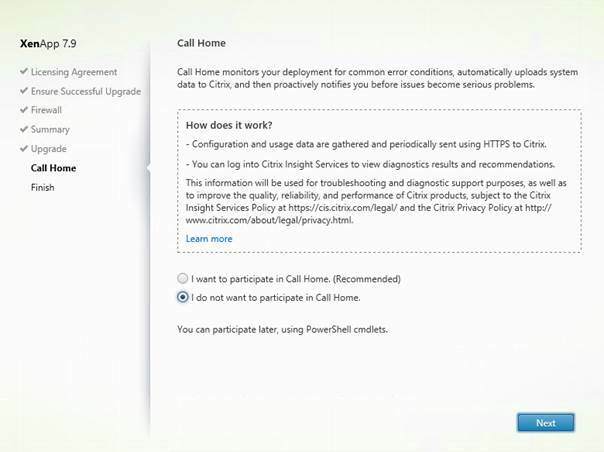 After choosing to participate or not in the Call Home program the upgrade of the software is finished and the final upgrade screen will be shown stating that the upgrade was successful. The next step is to start Studio to continue with the upgrade. If you want, the adminitration console can be started directly after the upgrade by checking the Launch Studio box at the end of the upgrade process. 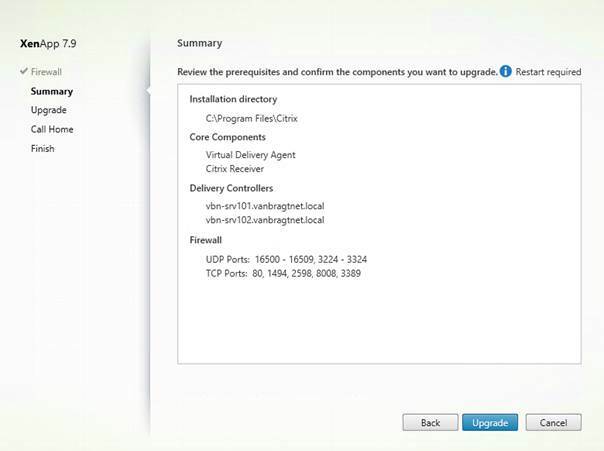 In the upgrade of the Delivery Controller, StoreFront and Director were automatically upgraded as they were installed on the same machine as the Delivery Controller role. However it would advise to install StoreFront and Director together on a different machine. In that case we need to upgrade the Director and StoreFront on that machine. The easiest way is to use the auto select of the ISO for this part as well especially if you installed the current version used on the ISO. For example StoreFront is often installed via the separate provided executable. First take a look at the upgrade process using the ISO. 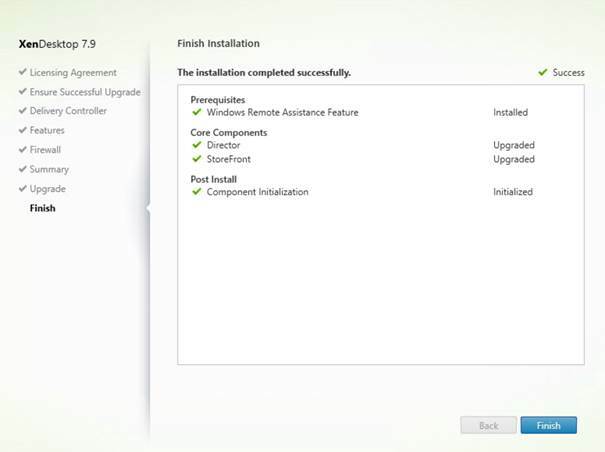 In the above steps we started the process of upgrading the XenDesktop environment to a higher version (in this article to version 7.9). We started discussing the upgrade order, showing that there are multiple paths to a successful migration. 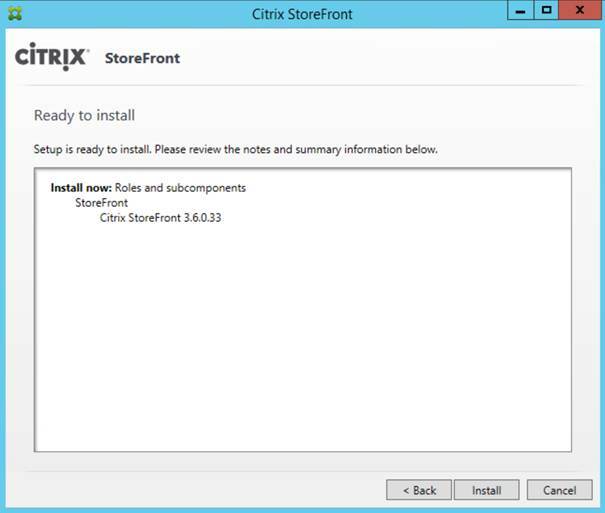 We continued with the upgrade steps of the Delivery Controllers, followed by Citrix Director and StoreFront. 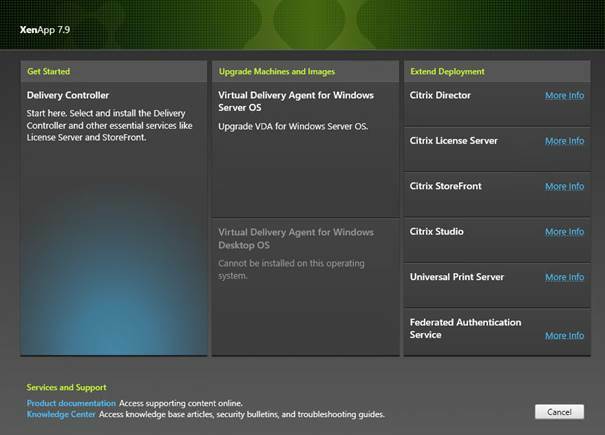 In the below steps I will continue with the Citrix StoreFront stand-alone upgrade, followed by the VDA upgrade. 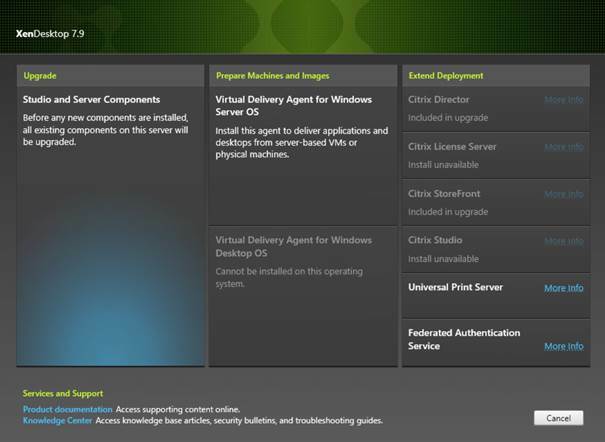 In the first part we upgraded StoreFront installed from the ISO of XenDesktop. However StoreFront is also available as a separate installation executable which is often used to install StoreFront. 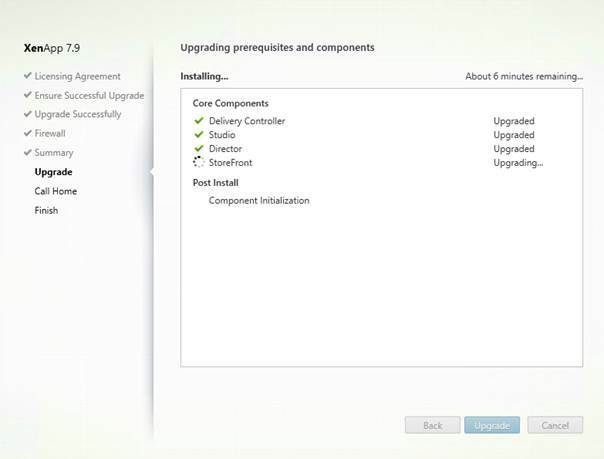 It’s a best practice to update via the same installation process as the original. So if you installed StoreFront using the installation executable, also update using the same process. 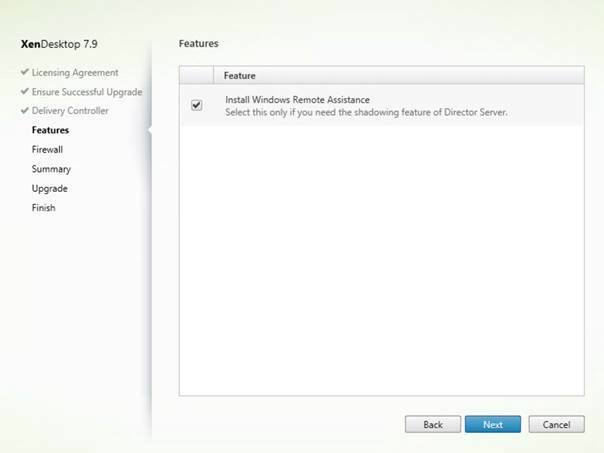 For XenDesktop 7.9 this means we are using the StoreFront 3.6 installation executable. 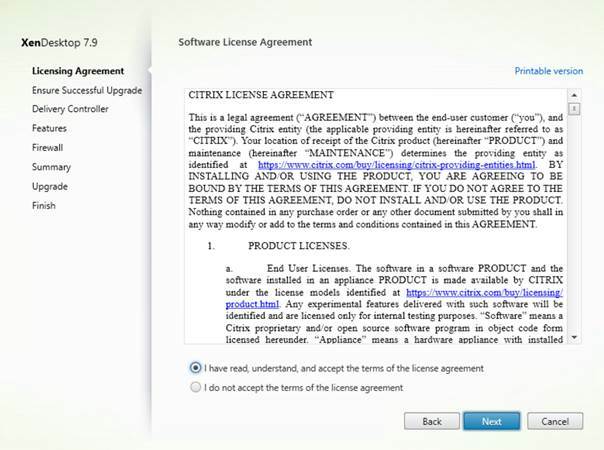 After double clicking the installation executable (StroreFront-x64.exe) the upgrade process will start with the License agreement, which logically should be accepted before the upgrade wizard will continue. The second step is already showing which will be installed (including prerequisites if required, but most will be already there). 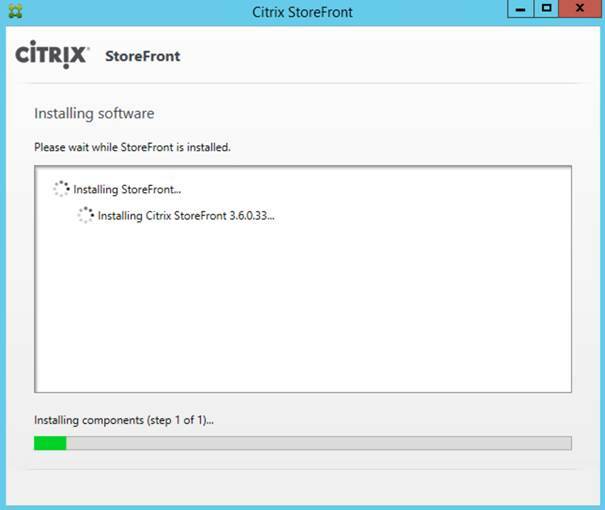 Just as the other Citrix installers the progress is shown during the upgrade. 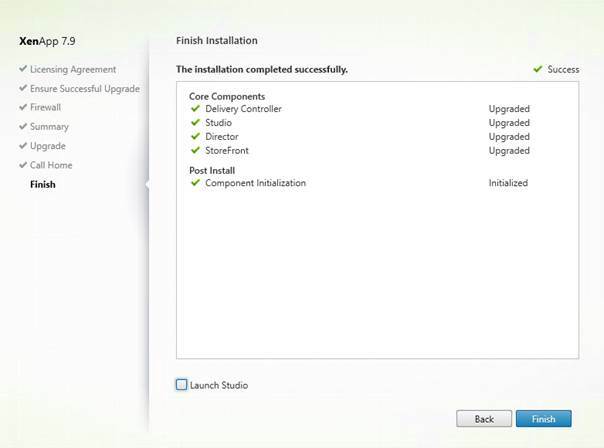 When the component is successfully upgraded the installation wizard will notify you. After pushing finish the upgrade is finished. If you look at the installation wizard it looks like the installation is a new install, however all your settings are retained. If you start the StoreFront administration console you will see that your earlier configuration, Store and Receiver for Web settings are still available, while you can see that the StoreFront version is on a higher level. If you need to do additional configuration steps really depends of which version of StoreFront you were running before. If you upgrade from a StoreFront 2.x to a StoreFront 3.x version you need to decide if you still want to use the Green Bubble look and feel or would like to change it to the Unified Gateway view. If you are already on a StoreFront 3.x and using the Unified Gateway you don’t have to do anything. What is really nice is that when you used the new way of branding/customizing the Receiver for Web these customizations are preserved, so your customized Receiver for Web is fully available after the upgrade. The first thing is about the way you are provisioning the VDAs. You can use PVS, MCS or your own technique. In this article I'm not going into details for each methodology (an article about upgrading PVS will follow after this series). I also presume you don’t have any active users on the machine. Logically the action should be executed on a machine that is not being used. The upgrade also requires a reboot. I will start at the point you are ready to actually upgrade the VDA software bits. This can be done via two ways. Using the autoselect on the ISO or download the executable VDA<>setup.exe. In this article I’m using the software for servers (XenApp), but the steps are the same for the workstation based VDA software. When using the ISO the start screen is shown where in the middle pane Upgrade Machine and Images will be shown. 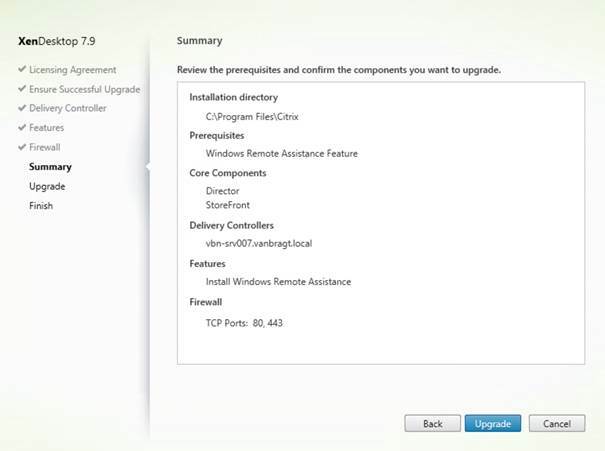 If you choose this option the same installation process is started when using the executable. The steps shown are exactly the same for both methods. 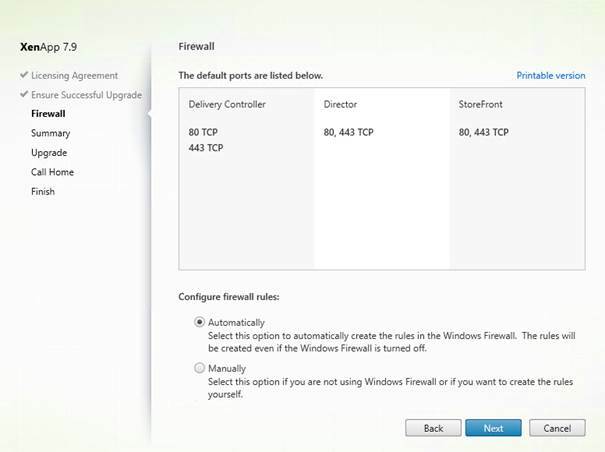 The upgrade starts with providing the option to configure the firewall automatically or perform the action manually. As these settings should already be in place (maybe you miss the framework ports if you upgrade from a lower 7.x version). 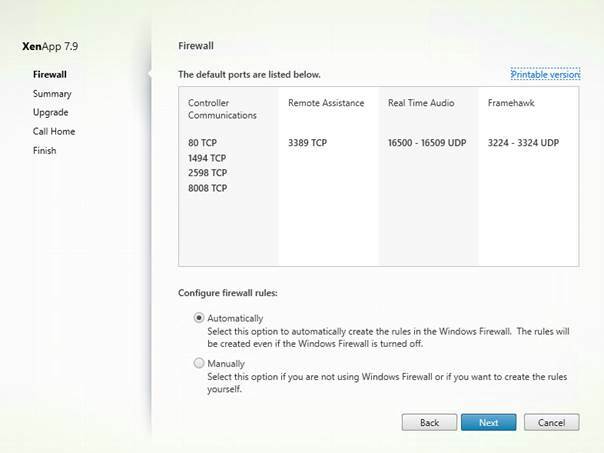 When you use the MS Firewall I would use the automatic option. Next a summary is shown with what information will be used during the upgrade. 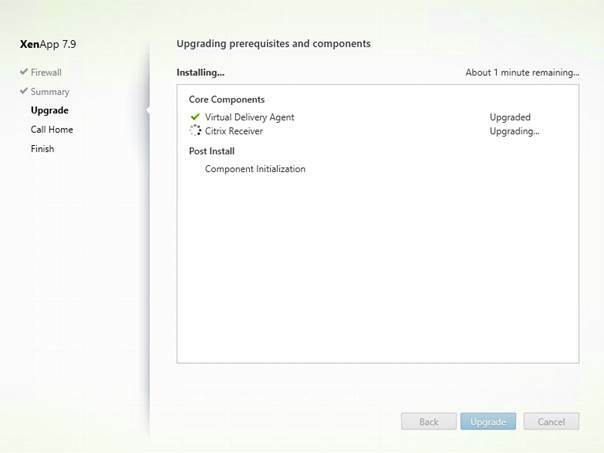 Also if prerequisites are applicable those will be shown (and automatically installed during the upgrade). 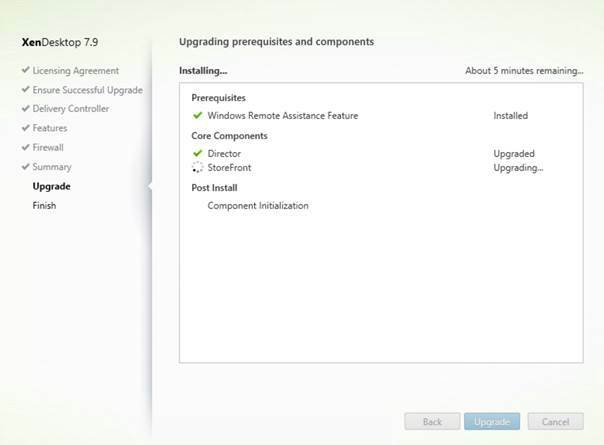 As I’m upgrading from 7.8 to 7.9 no prerequisites are already in place (same prerequisites for XenDesktop 7.9 as 7.8). After choosing the Upgrade button the software will be updated. 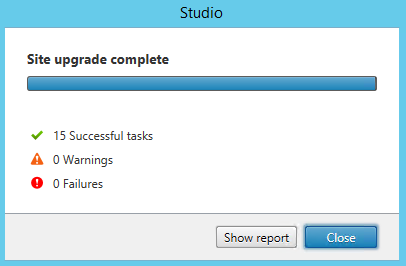 Just as with the other components the progress is displayed during the upgrade. 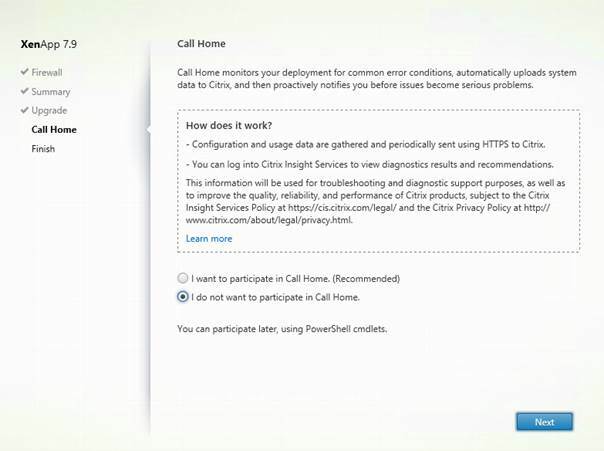 Also for the VDA the Call Home function can be enabled or disabled. Changing it later on can only be done with a PowerShell cmdLets. 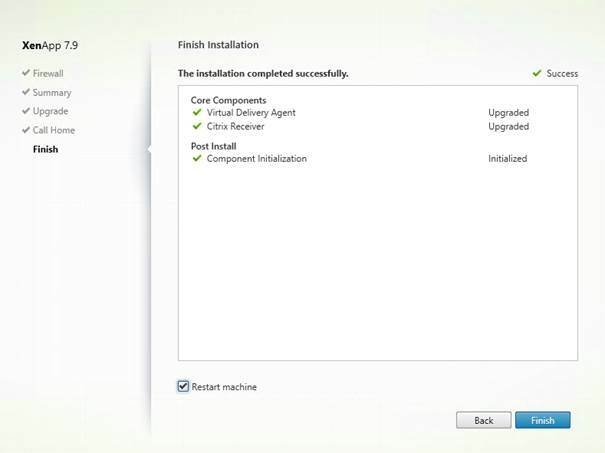 After configuring the Call Home, the installation process is finished and a summary will be displayed showing a successful upgrade. 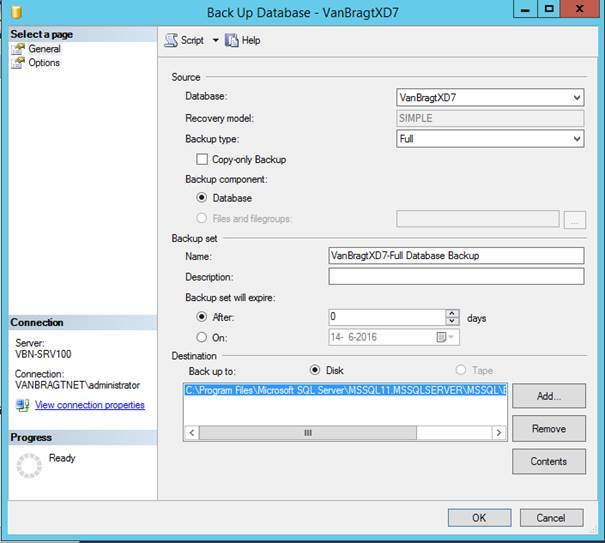 To finalize the upgrade the VDA needs to be restarted. When the VDA is started again you check within Studio if the VDA is reporting the correct version. You need to select the column agent version via Select Columns button. In my case the machines are now upgraded to 7.9.0.101. 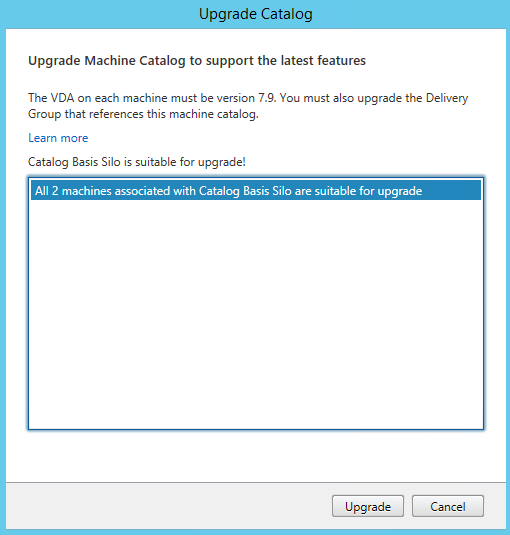 When all VDAs are upgraded within a Machine Catalog, you can upgrade the Machine Catalog. This will enable possible enhancements on this level. To start the upgrade of the Machine Catalog you select the catalog within Machine Catalogs and choose Upgrade Catalog out of the right mouse button menu or use the action pane on the right side of the console. 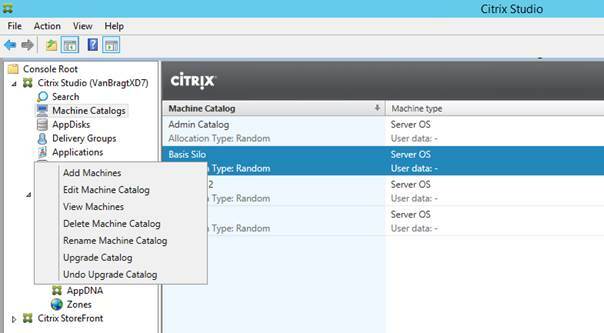 To upgrade a machine catalog the VDAs in the Machine Catalog need to be upgraded. The upgrade catalog wizard is checking that the VDAs are on the right level. If one or more is not on the required level the wizard will mention that and even shows which machines are not on the right level. However you can continue upgrading the machine catalog. 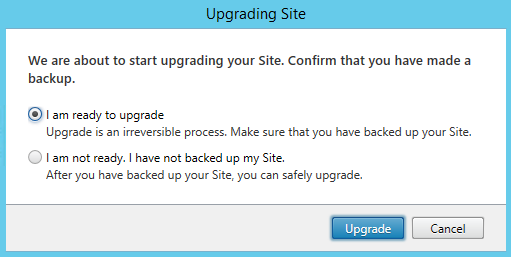 After pushing the upgrade button there is no feedback of the upgrade process. Personally it would be nice if there was a quick message that mentions that the upgrade of the catalog is successful. The same steps need to be executed on the Delivery Group. 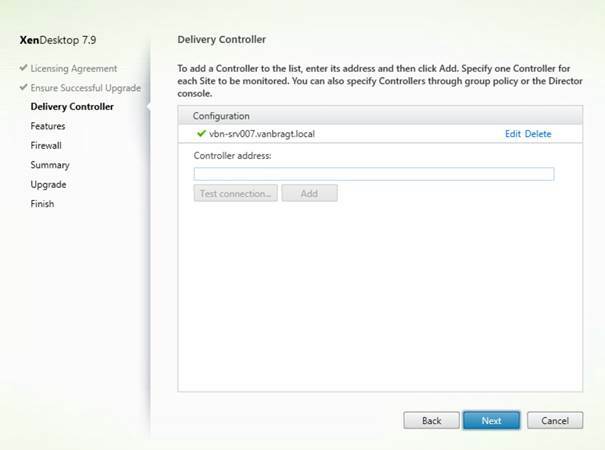 For this part you select the corresponding Delivery Controller and choose Upgrade Delivery group available in the right mouse button menu of the right pane called actions. 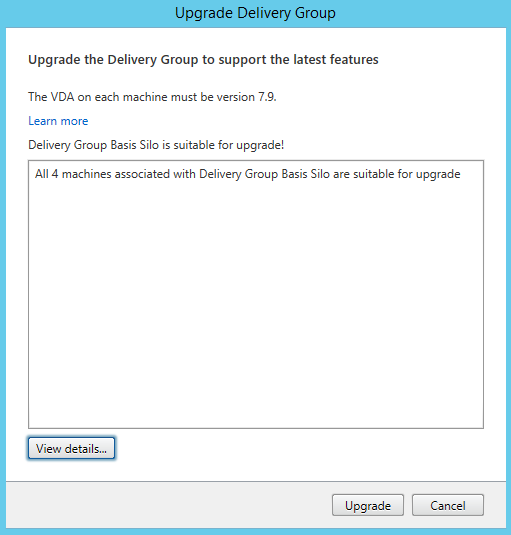 Also for the upgrade of the Delivery Group the VDAs should be on the correct software level. This is the same as at the Machine Catalog level checked by the upgrade wizard of the Delivery Group. If the level of the VDA is not correct a warning appears, but you can continue the upgrade if you want. No message is shown about the result of the Delivery Group upgrade, the same as for the Machine Catalog. If you have more Machine Catalogs and/or Delivery Groups you need to repeat these step for each Machine Catalog and/or Delivery Group. 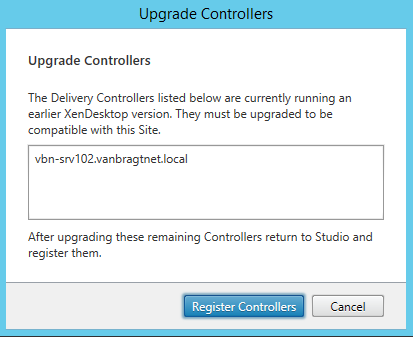 After all Machine Catalogs and Delivery Groups are upgrade we also ended the upgrade steps for XenDesktop. If using the current release you only have to wait for the next quarter to redo these steps for the next version. 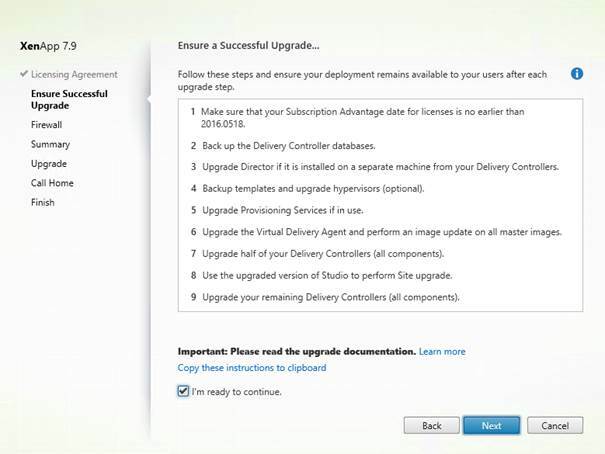 In this article I described the upgrade steps of a XenDesktop environment. 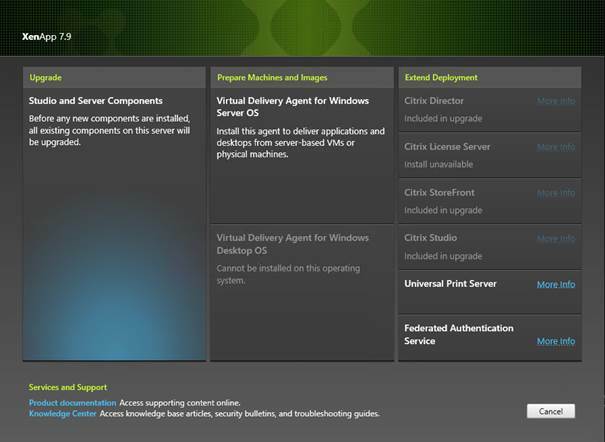 In first part we started with the upgrade of the Delivery Controllers, followed by Citrix Director and Citrix StoreFront. 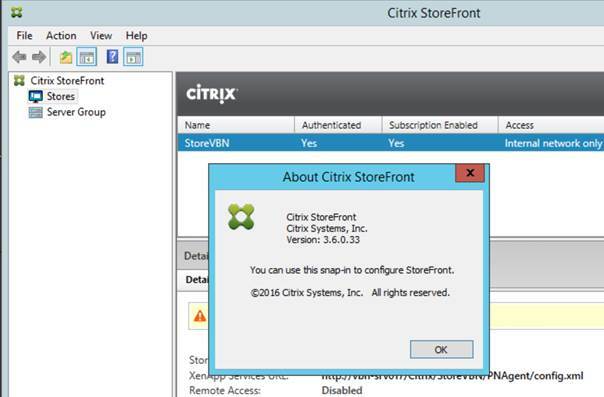 In second part described the upgrade steps of the stand-alone Citrix StoreFront installation and the upgrade of the VDAs, the Machine Catalogs and the Delivery Groups. 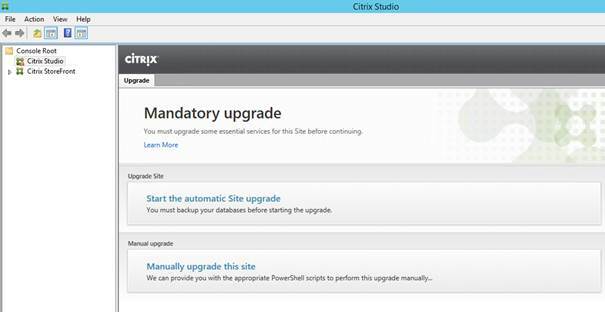 Citrix made the upgrade pretty smooth and easy, which logically was a requirement if you release a new version each quarter. Because the process is smooth and easy I don’t see any issues to keep up to date using the Current Release lifecycle of XenDesktop for many organizations.